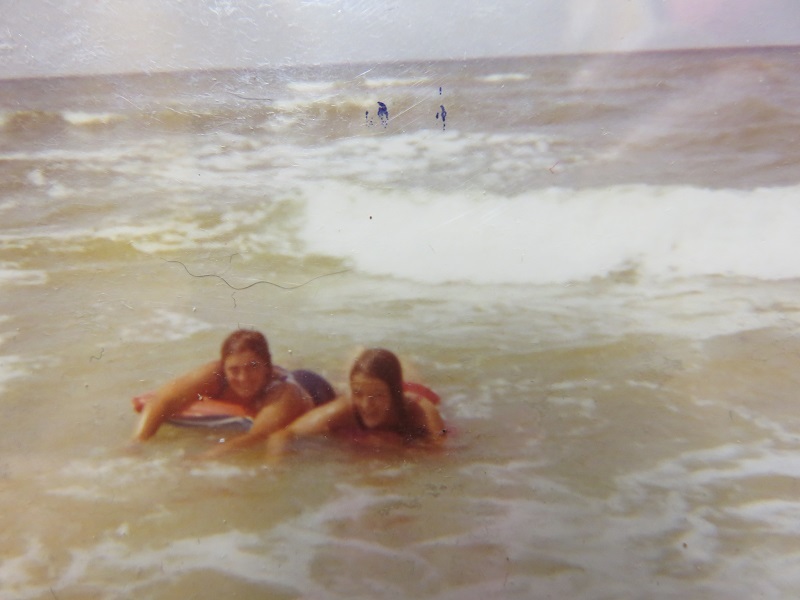 Beloved Memories of Mexico Beach, Fla.
My sister Pert and I riding waves at Mexico Beach circa 1970. To be honest it wasn’t that much of a beach to begin with but it was “our” beach, only 38 miles or so from my home in the panhandle of Florida back in 1969. We could whip down there on a Saturday afternoon after chores were finished or even after church on Sunday and enjoy a few hours relaxing, swimming, jumping waves, walking the beach, enjoying a sunset. For a girl from landlocked Indiana (except for Indiana dunes on Lake Michigan, another lovely spot), it was a dream come true, and one of the main reasons, truth be told, I was willing to move to Florida for my senior year of high school. My parents had offered several times to let me finish out high school at Bethany Christian school I had gone to in northern Indiana for three years, where I had the best of friends. There would have been aunts I could have lived with. But I was gung ho to move, and the beach had a lot to do with it. 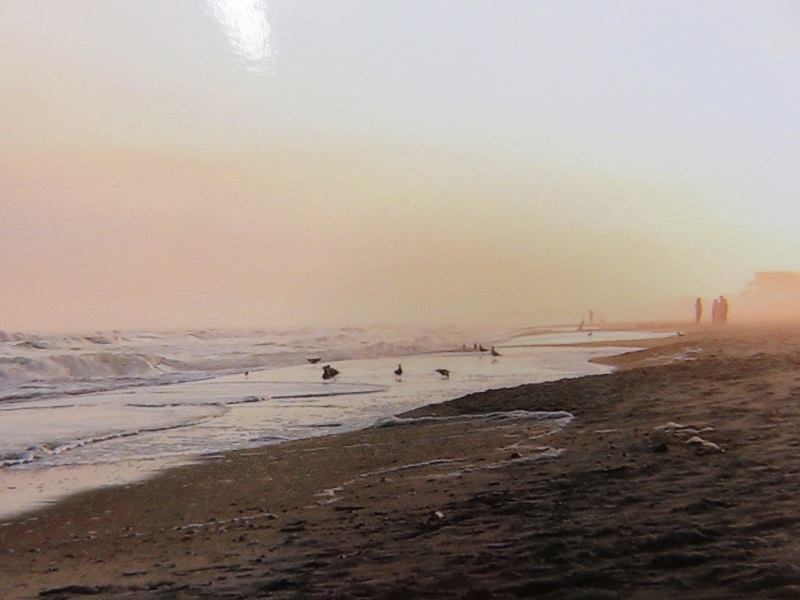 An early visit there the spring of 1969 drew me with the constancy of waves lapping on sand. My grandmother went with us on that trip and burned her ankles (the only space exposed to the sun with her long dress) as we walked the shore. I now live five hours from the beaches in Virginia distance-wise, but we’ve never attempted to make a day trip out of it—always overnight, always heavy heavy traffic (especially in recent years) getting there. Getting to Mexico Beach was an easy drive on back roads straight and smooth—the biggest danger going home was drifting off to sleep after a half day of the warm and beautiful Gulf of Mexico. 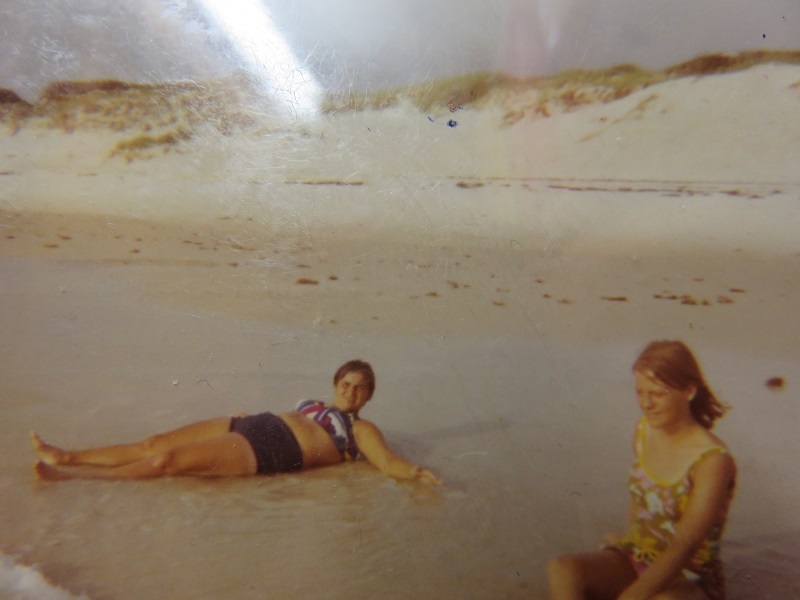 My friend Deb and sister Pert at Mexico Beach 1970. So we loved it and had many a family picnic there on Fourth of July or Labor Day or anytime we needed a getaway. The original facilities were a simple Florida wayside park with sturdy cement picnic tables, benches, and shelters, and a place to change and shower off. We sometimes set up makeshift tents with poles and sheets in the sand, long before canopies for such purposes came on the scene. Eventually a brother-in-law owned a small catamaran sailboat on which we had plenty of adventures. A close friend from my class in Indiana visited after we both graduated high school and we spent several days relaxing and sunning on the secluded beachfront which midweek was almost empty. I remember one nearby store where one could get snacks, drinks, suntan lotion. A small local restaurant at a north Florida beach in Feb. 2010. 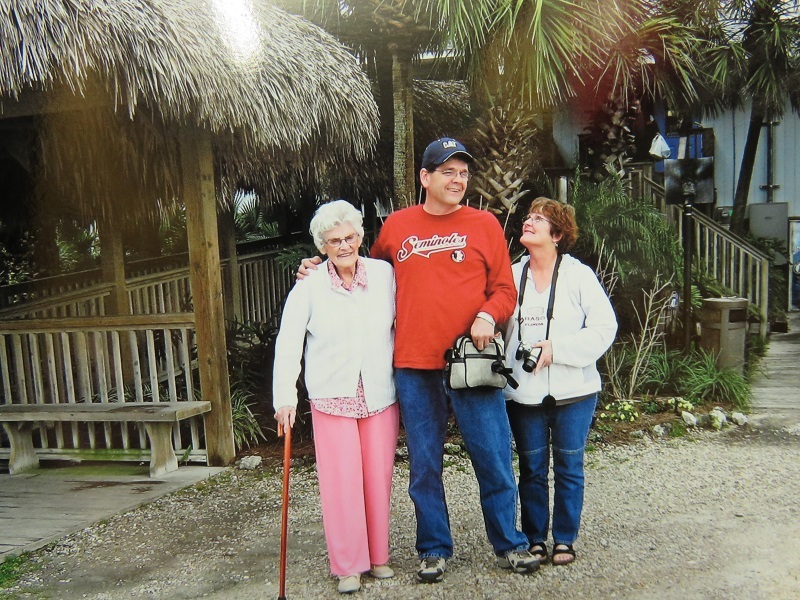 My mother, brother Terry, and sister Nancy. They’re laughing because my brother was carrying Mom’s purse for her. In the last 40 years Mexico Beach (year-round population still only around 1000) has of course been built up with hotels, beach stores, condominiums, beach houses, the works. All these things supplied much needed jobs and opportunities for folks living in nearby counties, where making a living has always been a lot of hard work and long commutes to either Tallahassee or Panama City for better paying openings. As a college student, one summer I drove one hour to work at a restaurant on the Panama City beach, sometimes staying over at a home where an elderly man had advertised a room in exchange for help cooking as he cared for his wife dying of cancer. The videos, photos and aerial shots from Mexico Beach after Hurricane Michael are devastating and shocking. Sure, hurricanes hit every year, somewhere, and this was ground zero. My brother, who lives in a nearby county, said it was disorienting to drive around because you couldn’t recognize things. They rode out the storm but would have evacuated if the upgrading of the storm to a “4” instead of a “3” had come earlier. 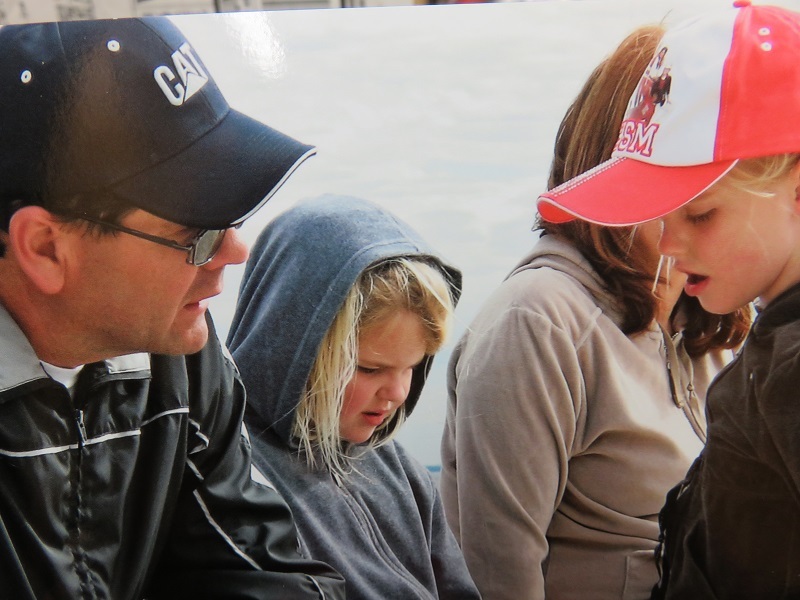 My brother and some of his family on the beach, Feb. 2010. Recovery from massive storms and floods takes patience, time, and lots of help from all around. Help can never be distributed evenly or fairly—but as my brother said, with neighbors and family, they’re getting by. The downed trees and devastated homes and businesses will take months and years to clean up. If you can help, check out opportunities from Mennonite Disaster Service, Brethren Disaster Service, Presbyterian Disaster Service being three I know about first hand. They funnel volunteers, supplies and monetary gifts to those in need—rebuilding for years after storms. God bless and guide and grant safety to all those helping their neighbors, and strangers helping strangers. Update: I was pleased to hear at least one local school resumed having classes just yesterday (Nov. 1) even though many homes do not yet have electricity restored. You can follow a Facebook group, Calhoun Strong for photos and updates and information regarding recovery efforts and indeed—neighbors telling neighbors where they can find help. Mennonite Disaster Service at https://mds.mennonite.net/ or this address: 583 Airport Road, Lititz PA 17543. Brethren Disaster Ministries, www.brethrendisasterministries.org or here: Church of the Brethren, 1451 Dundee Avenue, Elgin IL 60120. Presbyterian Disaster Assistance https://pda.pcusa.org/situation/hurricane-michael/ , or here: P.O. Box 643700, Pittsburgh, PA, 15264-3700. My email is anotherwaymedia@yahoo.com or Another Way Media, P.O. Box 363, Singers Glen, VA 22834. Another Way is a column by Melodie Davis, in syndication since 1987. She is the author of nine books. Another Way columns are posted at FindingHarmonyBlog.com a week after newspaper publication. Thank you for this “blast from your past,” tinged with sorrow over the devastation in the Panhandle recently. I found it interesting that you drove one hour to work at a restaurant on the Panama City beach, “sometimes staying over at a home where an elderly man had advertised a room in exchange for help cooking as he cared for his wife dying of cancer,” a win-win situation for sure. The 2010 photo made me laugh, your sweet mama and sister with brother carrying a purse. It was a win-win except I didn’t know much about “cooking southern” at that time. He taught me or told me what to do. It was interesting for sure. Thanks for your comments. I am touched by your post on Mexico City. I think often of the unfortunate people there, and how their lives have forever been changed after Hurricane Michael. So many have been affected not only materially, but emotionally. I pray these organizations will be able to minister to those most in need. Yes, Mexico Beach was a special place, thanks for your thoughts, Elaine, and prayers.